I thought I'd share the Otto family calendar page from, ahem, July 1982, when I was 11 years old. Funny how you can just dig these things up at a moment's notice, isn't it? We were living on Willow Street in Montoursville at this time, and July was filled with swim lessons, Boy Scout meetings, a three-day Boy Scout camping trip (possibly Camp Karoondinha), some birthdays, a trip to Houston to visit my Uncle Charles and his family1, and other assorted events. 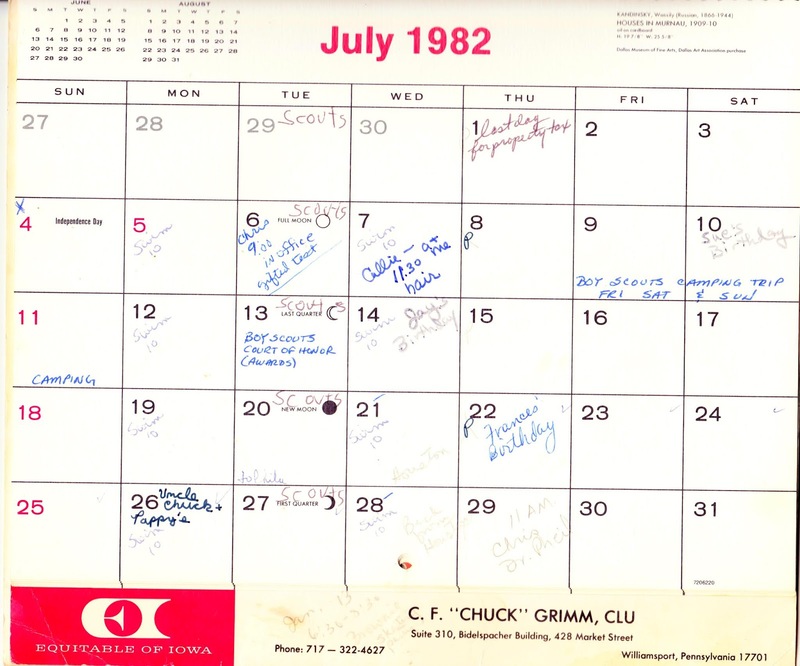 I believe the only handwriting on this page that's mine is the word "SCOUTS" on Tuesdays and the listing for Uncle Charles' and Pappy's birthdays on July 26. 1. I think we saw Nolan Ryan's 200th career victory at the Astrodome on July 27, 1982.